A smooth water surface reflects sun light like a mirror, an effect referred to as specular reflection. The angle of the incoming ray is identical to the angle of the outgoing ray with respect to the surface normal, thus producing a mirror image on a perfectly calm water body. 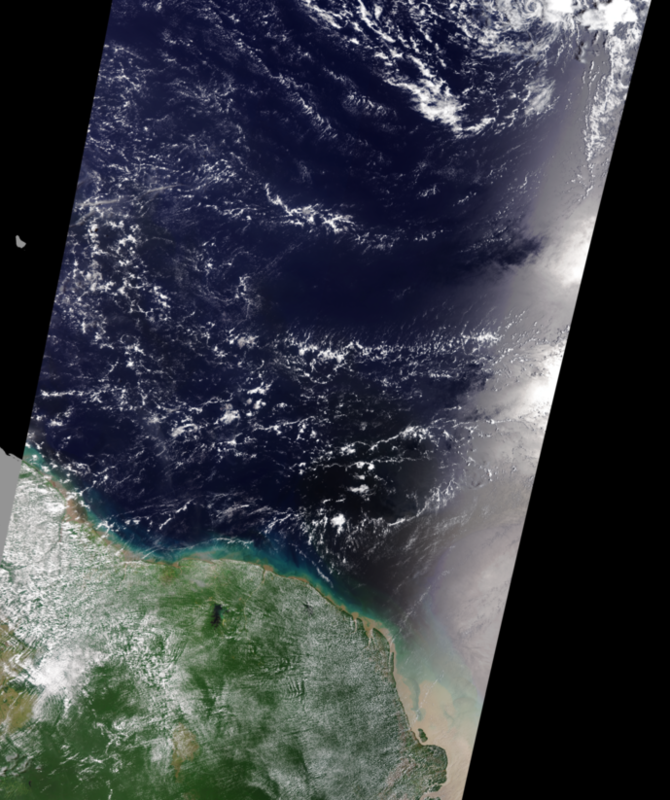 Figure 1: Full swath of MERIS RGB over the ocean with an along-track area of sun glitter at the right edge of the swath. A calm sea is, however, rather the exception. Instead, the sea surface is continuously displaced by waves and thus consists of a myriad of differently inclined planes. The farther these planes are from the horizontal specular point, the more they have to be inclined to reflect a single ray of sun light to the observer, i.e. to cause an individual sun glint. The sum of all such sun glints is called sun glitter, an area of bright and sparkling reflection of the sun, called “dancing highlights” by Cox and Munk (J. Opt. Soc. Am., 44(11):838-850), whose location and extent depend on the angle between sun and observer (or satellite) and the roughness of the surface. Figure 1 shows an example for sun glitter at the edge of a full swath RGB image over the ocean captured by the MERIS instrument. Sun glitter is well known to everyone who has ever witnessed a sunset over the ocean and has been studied by scientists for centuries. In their seminal paper published in 1954, Cox and Munk laid down the foundation for ocean glitter research by explaining the relation between the statistical distribtions of surface slopes and sun glitter. The location, extent, and characteristics of ocean glitter thus contain information on the spatial distribution of ocean surface roughness, from which wave kinematics parameters and surface currents can be derived (e.g. Kudryavtsev et al. (2012), J Geophys Res-Oceans, 117:C4). The appearance of sun glint is determined by currents, waves, wind and surfactants and can thus can provide rich information on the upper ocean dynamics, e.g. on bathymetry, internal waves, biological processes and anthropogenic influence. In SAroNG, we aim at sustaining the significant scientific progress achieved over the past decade in understanding the processes which form sun glitter and in the interpretation of the information it contains. Note, however, the stark contrast to the most common application of optical remote sensing over the ocean, the retrieval of ocean colour, for which sun glint is an unwanted feature that is routinely detected and flagged, because it makes it impossible to measure the the optical poperties of the water body. In SArONG, the team will retrieve Satellite Sun Glint Images (SSGI) from a series of instrument, focussing on the recently deployed Sentinel 2 and Sentinel 3 satellites, but also including more established instruments like MERIS, Landsat8, and MISR to explore the role of instrument characteristics in the retrieval of SSGI. This appears to be a challenging task as so far instrument design of ocean colour sensors has been continuously optimised for measuring even smallest variations of the light scattered back from the water column and not for measuring sun glitter. In fact, some ocean colour instruments are even designed to avoid the sun glint by tilting the instrument. A complementary strain of activities, which nicely links to the early days of this research field, involves the usage of cameras mounted to drones and airplanes to generate images of ocean glitter. 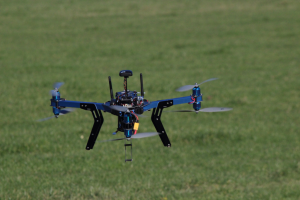 A drone used by the University of Exeter to carry cameras for the measurement of Ocean Glitter.